Silk Mountain Creations | Installation We don’t just install — we pride ourselves in doing a professional job. It’s show time and the curtain goes up. The right installation can make or break even the best design and fabrication. It’s HOW the curtain goes up! 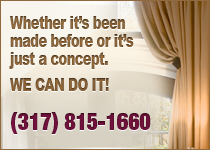 Whether it’s been made before or it’s just a concept—WE CAN DO IT! Tell us what you want . . . . . . . . we’ll accept the challenge. 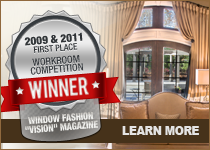 An award winning, wholesale to the trade workroom owned and operated by Catherine and Mark Schulz. We are professional fabricators and problem solvers. We work with designers to create beautiful, unique window treatments and soft furnishings.